I had a good week – I got lots of work done, had some good sessions at the gym and a fun Friday night out. I woke up on Monday with a swollen left eyelid. It wasn’t particularly painful, more uncomfortable, and it didn’t look very pretty. After my session with Rama, Mum and I had some lunch and then went to the mall. I needed to go to the chemist for my eye, she needed to get a birthday card, and we needed to go to the Virgin Megastore to pick up tickets to see Il Divo (she was very keen). After the mall, we decided to go to Gitex Shopper (the Gulf IT exhibition) at the World Trade Centre. Monday was its fourth day and I didn’t think it would be crowded. I was wrong. It was crowded and noisy, and walking down the middle aisle was like being in the line of fire with sellers trying to entice you to their stands. All I wanted was a 1TB hard drive to back up the files on my laptop. I was also tempted to look at a new lens for my camera but I wasn’t in a rush for that and I hadn’t done any research on prices. I picked up my hard drive from Seagate, we walked around the quieter stalls for a while and Mum picked up a portable steam iron. After an hour or so I wanted to get the hell out of there. I’d had enough. On Tuesday my eye was worse but I thought I’d give the eye drops some time to start working. I was starting to look like the guy in ‘The Goonies’ (‘Hey, you guys!’). I stayed home all day. I had a massage at Dreamworks on Wednesday afternoon. It was just average. I think the massage I had at the Emirates Grand Spa a few weeks ago has ruined other massages for me! Later that evening Mum and I went to see my aunt and uncle as they were travelling the following day. On Thursday afternoon we went for mani/pedis at the Fairmont and for dosas that night. I didn’t make any big plans for Thursday night as I wanted to go to the gym the next day and I knew Friday night would be busy. By Friday morning my eye was looking normal (more or less). 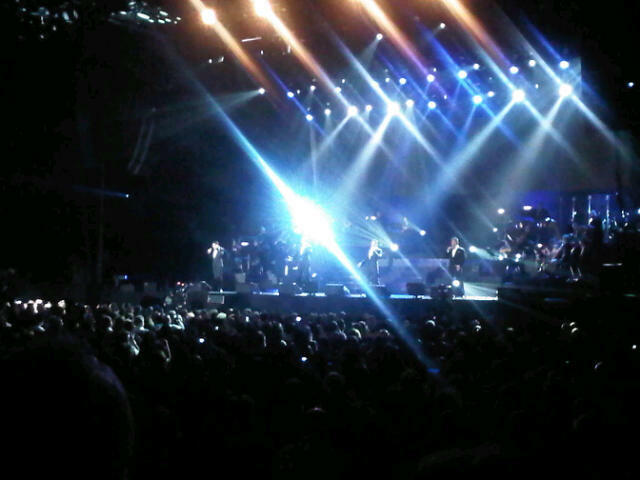 Mum and I went to see Il Divo at the World Trade Centre on Friday evening. They were good, but I don’t think I’d see them in concert again. Not on a Friday night, anyway. After the concert I met up with a friend at Zuma. It was almost midnight and it was packed. We had a few vodkas and then decided to move on to Cavalli Club at the Fairmont. I’d never been there – we had no trouble at the door and walked right in. The place is huge and not as crowded as I thought it would be. We got a couple of drinks, walked around, enjoyed the music, chatted to some random people, and left after it closed at 3am. I got home and for some reason thought it would be a good time to watch an episode of ‘Grey’s Anatomy’. It was 5am by the time I went to sleep and I was awake at 9am. Saturday was a write-off – I didn’t feel like doing much and spent the day at home.